Avda. Canovas Del Castillo, 24, 36202 Vigo, Spanje. 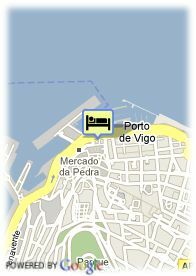 This is a central apartments in front of the port of Vigo. Placed between the seaport and the Calle de la 'Piedra'. 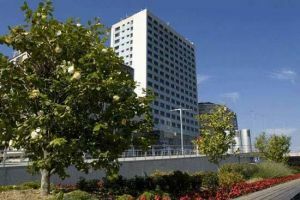 The apartments Bahía de Vigo offer you the services and facilities you can find in a hotel, among them a cafeteria-bar, a restaurant specialized in seafood and indoor parking. With 64 apartments, each one is made of one room with a double bed or two twin beds, as well as fully equipped Bathroom and hydro massage bathtub, safe box, dial-phone, mini bar, interactive TV and Wi-Fi connection. Without air conditioning or cuisine. Betalende overdekte parking aan het hotel (11.77 €), Reservatie verplicht. Voor oudere kinderen en volwassenen wordt 35.82 € per extra bed aangerekend.